Growing up I viewed bees as the enemy because my mother is very allergic to them. I hated the enormous Callistemon in our backyard because it was buzzing with insects that wanted to kill my mom (in my mind, at least). I'm terrified of spiders and I still scream if an ant or beetle crawls across my foot in the garden. As a result, I don't know how to explain how obsessed I've become with bugs. I was going through Kate Bryant's archive on Portland Monthly and ran across an article on attracting pollinators to your yard which somehow led to this plant list that will help attract beneficial insects to your garden, which led to me completely falling down the pollinator rabbit hole, all of which culminated in reading this article on neocotinoids and their devastating effect on pollinators. 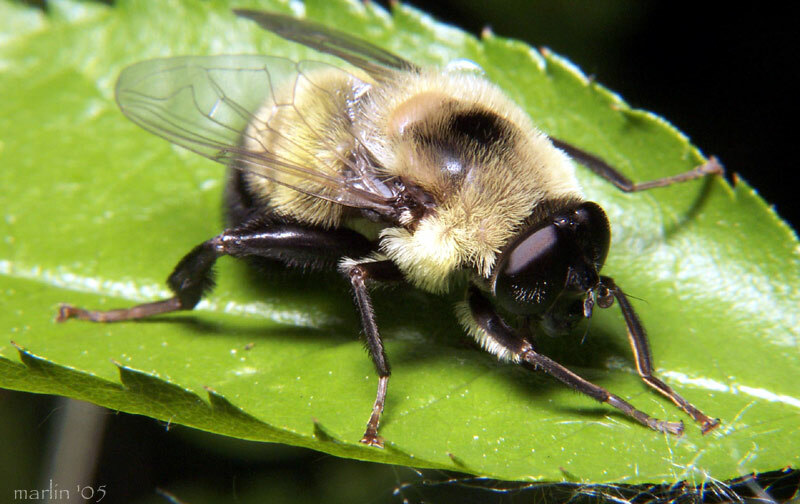 It left me sort of depressed and then 50,000 bumblebees were killed by a landscaping company who sprayed some linden trees in a Target parking lot with pesticide and I was really depressed. So what do we do when we get sad? We buy plants! What do we do if all the nurseries are closed and we're feeling impatient? We buy them online! 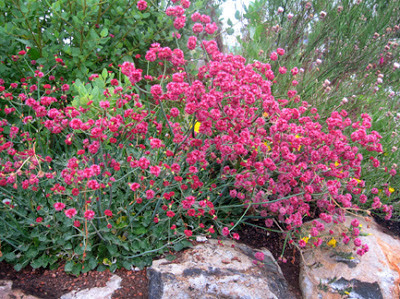 I placed an order to Annie's Annuals for a buckwheat I'd had on my wishlist for a long time: Eriogonum grande var. rubescens. Buckwheat is a favorite plant for hover flies, whose larvae eat aphids, a LOT of them. The larvae can eat an aphid a minute but they don't eat your plants. They look more like bees than flies. Aphids were the reason that landscaping crew sprayed the linden trees, killing all of those bumblebees. We have a pretty bad problem with aphids on the roses in the lab, so I placed a buckwheat there. 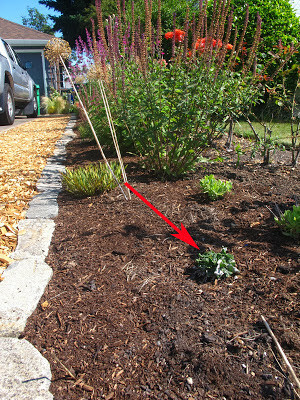 Of course, I ripped out most of my roses but my next-door neighbor still has about 15 planted here. Now I just have to hope that her mow-and-blow guys don't spray this area. Buckwheats like it hot and dry, which is perfect for this area. This buckwheat is evergreen and tidy, growing to 1' x 3'. The undersides of its spoon-shaped leaves are silver and fuzzy. I want to find a spot in the backyard for another, since the cabbage aphids have recently discovered my edibles. 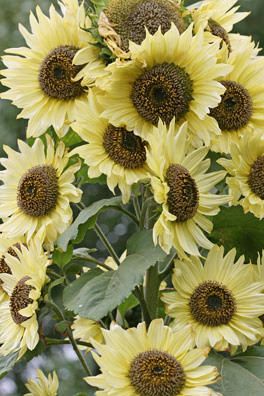 I've never had a desire to grow sunflowers but I gave in and ordered 'Lemon Queen' which is the official sunflower of The Great Sunflower Project, which has been tracking honeybee colonies for years. 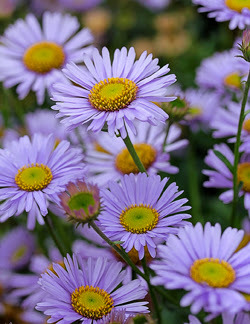 I also picked up some Erigeron glaucus 'Wayne Roderick', which is supposedly loved by bees. And it's pretty. Then this weekend a friend and I went to Portland Nursery and I picked up something for the butterflies: Achillea millefolium 'Terracotta.' After being like, "Where are the freaking butterflies?!" I've witnessed two swallowtails sailing through my yard. I haven't yet witnessed them landing or feeding on anything, but hopefully they'll check out my garden and tell their butterfly friends, "That place is cool. We should hang out there." Are you unhealthily fixating on anything lately? Any plants I'm missing that will single-handedly repair the damage all these landscapers have done? Sometimes it feels like that's what I'm trying to do. I'm trying to come to terms with pollinators I've always hated, like wasps. We frequently have them drinking from the bird bath (cute!) and I know they're important predators of bugs that cause a lot of destruction in the garden, but they still make me nervous. Yes to all the above! I saw Buckwheat everywhere this week, and now I'm obsessed with finding room for one (especially the red like you've got). I heard a rule of thumb once, though don't know how true it is, that while Hummingbirds are especially attracted to red, insects are drawn to blues and purples, since their eyes are more geared toward the ultraviolet end of the spectrum. Just from observing, Agastaches are the stars of my garden, as far as pollinators are concerned. Bumblebees, honeybees, butterflies and hummingbirds all love them...and they bloom for such a long time. Echinacea are a favorite of anything that flies, it seems, as are Knautia, Monarda and Persicaria. Anything that blooms in an Umbel is going to attract pollinators...Selinum, Daucus carrota, Astrantia, Achillea...all are very popular with bees. The one plant that beats them all out, however, is Joe Pye Weed...especially for Bumbles. When it starts blooming, the flowers practically seethe with Bumbles drunk on nectar. It actually freaked Norm out the first year we had them...now, he actually looks forward to it. Wasps build nests in the roof over our deck. They kind of freak out visitors, but the only time I've been stung was when I tried to cut back the vines around the nests. No more of that, so just ignore the unkempt dying clematis vines overhead, will you? 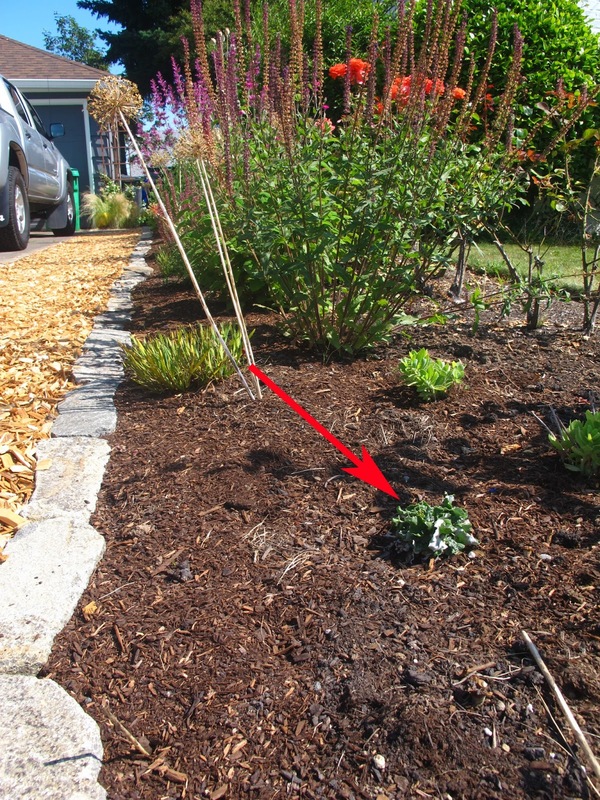 I was surprised and indignant when the Multnomah Water Bureau came out to consult about eradicating English ivy and their first choice was Roundup. I was expecting better from those guys. You read my mind with this post! I've been fixated on the bees in my side yard (in fact, I'm renaming it 'Abeille Allée', French for 'Bee Lane' - sounds better than 'side yard', but I digress). They are everywhere and though I am afraid of being stung, I really enjoy watching them buzz around. It makes me feel like I'm doing a little bit to combat those jerks who killed all of the bees. They are in LOVE with my Nepeta 'Souvenir d'Andre Chaudron' and my St. John's Wort bush in the allée. I also just planted geranium and penstomon there, and am waiting for the dahlias to come up - all apparently bee friendly. I'm going to look into the buckwheat and the sunflowers! Oh my gosh, that's such a beautiful name for a side yard! Now I want to come up with something pretty for my gravel alley. I love penstemon, particularly the way the bumblebees stuff their fat little bodies into the blooms, causing their buzzing to amplify. I really want a St. John's wort--they are so wonderful in bloom. I can't believe the county is recommending/using RoundUp! That seems so short-sighted. Of course, I was just reading about a program in Southern California where they reimburse homeowners for replacing their lawns with drought-tolerant plants to save water and keep chemicals out of waterways. Their recommended lawn removal tool of choice? Three rounds of RoundUp. It makes me crazy. I'm afraid that I can't get over my dislike of wasps - they're so much more aggressive than most bees and, after being stung on numerous occasions and puffing up like a balloon, I'd prefer they go elsewhere. That said, I've never actively driven them from my garden. I co-habit peacefully with the bees - they love Cuphea ignea 'Starfire Pink', Gaura, and African Blue basil but, even when I fumble among those plants laden with bees, I've never been stung. I can't say that I like ants - my garden is absolutely loaded with them too - but, as long as they stay outside, I leave them alone, especially as someone told me that the presence of a lot of ants can keep termites at bay. Good luck attracting more friendly pollinators! My bees go crazy for something called mountain mint. I love it too - 3 feet tall and small green flowers. Pycnanthemum-I looked it up. I should really donate that five dollars to wiki. Once at a bee display at the state fair I asked the people where they thought my bees lived and they guessed from someone's hives that are about a mile from me. I've meant to visit (my bees!) though I have not. But I really like knowing their history. If you have seen swallowtails I would wager there are eggs (little orbs that are white at first then yellow then black) or caterpillars (black at first)...on your new RUE! yea you! My obsession requires me to bring them inside to protect them from spiders and birds where I stare at them for ridiculous amounts of time. Molting is crazy. Love the buckwheat but it seems out of my zone 7. My ongoing frustration has been the paucity of butterflies lately. Even bees seem in much shorter supply. Usually there are tons of them in the garden by now. I agree with Scott that Agastaches do a super job of attracting pollinators. Also Echinaceas, Solidagos, and some Asters (Symphyotrichum). Oh, and Asclepias and Oregano! I may have to bring some eggs in if I find them--I love that you do that! I started out as an edible gardener, but I realized pollinators and predatory insects need a continuous source of flower nectar and pollen, plus habitat, to survive and do their job, so I branched out into a wide diversity of flowers. Some that do very well on both counts are to plant cole greens like kale, collards, turnips, and mustard by July 15 (so they will get big enough to overwinter), then harvest part of the plants or leaves for fall vegetables, leaving part to overwinter for very early spring greens and flower buds (like small broccoli), then allow the plants to bloom and go to seed, making lots of yellow flowers for bees. There are a continuous succession of dandelion/ yellow composite flowers in my yard that provide food for bees but drive me crazy trying to control them. Mints are also very attractive to bees, though control is also an issue with them. Hardy geraniums have a very long bloom season. A microscope or magnifier is fun - the eggs are transparent and you can see the caterpillar inside. Educational! Still no butterflies here in our all of a sudden monsoon season though my csa farmer ( I hate harvesting too and she is so amazing) gave me a chrysalis that had formed on some chard. Hope it found a mate. I worry. Also -we have more and more clover in the yard and it seems to attract more bees than usual for this time of year. Your journey from bug averse to pollinator lover sounds like mine. I too was afraid of all buggy things and have learned through gardening to not just enjoy them, but actively try to get bugs in my yard! Diversity is the key -- lots and lots of different plants blooming at all different times. You are well on your way with what you are planting. The ones I notice the most are big bees on my NJ Tea (ceanothus americanus) and my sourwood when it blooms, and the agastache as Scott notes. Swallowtails love the lindera benzoin (spicebush) and the swamp milkweed attracts other butterflies in the meadow. The bees love asters, caryopteris (oh my, it's a buzz factory) and really I could go on and on. They will find you. The picture of the "Bumblebee" is a robberfly mimic of the bumble bee. Notice the short antenna and forked feet. So is that not a hover fly? That's what the photo source said it was.